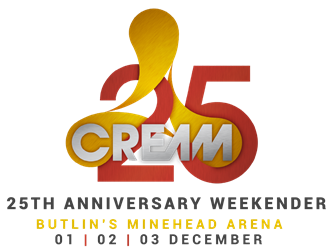 To celebrate Cream’s 25th Anniversary milestone the brand will be staging a series of events throughout the year in the run up to their latest endeavour the Cream 25 Weekender, an anniversary finale in association with Butlin’s Live Music Weekends. Culminating a busy year of shows for a festive blowout, they’ve teamed up with Butlin’s to take over their resort in the coastal town of Minehead in Somerset on Friday 1st - Sunday 3rd December for a three day celebration, joined by over 50 of their favourite DJs from the Cream dancefloor over the last two decades. Confirmed acts include Faithless (DJ Set), Paul Oakenfold, Paul van Dyk, Dave Seaman, Darren Emerson, Eddie Halliwell, Graeme Park, Jeremy Healy, Jon Pleased Wimmin, Judge Jules, K-Klass, Mauro Picotto, Seb Fontaine, Tall Paul, X-Press 2, Andy Carroll, Andy Joyce, Anthony Probyn, Ed Mackie, Jemmy, Paul Bleasdale, Rob Harnetty, Sean Hughes, Stuart Hodson & Samuel Lamont plus many more still to be announced. The multi-roomed weekender will take fans on a musical journey from Cream’s humble beginnings to present day. Expect lots of vinyl, pool parties, fairground rides and general daytime fun and good times with a gathering of 6000 likeminded souls joining together for one big Christmas disco. Tickets on sale now and start from £185 per person. For more information go to http://weekender.cream.co.uk.